A son who wrote an unkind obituary about his late mother who died on Thursday at the age of 80 has gone viral since it came out in public. A Minnesota newspaper that published the paid obituary on its website was criticized for it. The obituary posted in the newspaper revealed about the deceased woman’s affair with her husband’s brother and abandoning her two children. 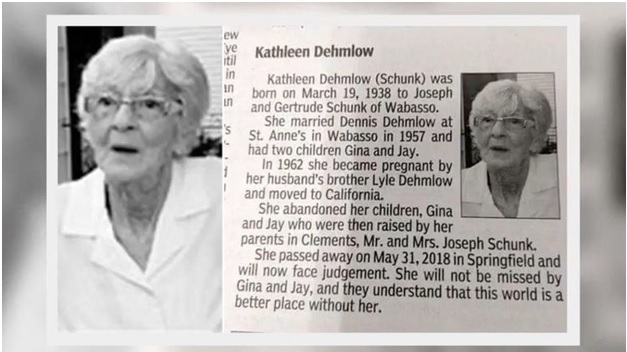 However, when the obituary of Kathleen Dehmlow was criticized by the readers, eventually the newspaper had to pull it down from their website. In the new sentence, the obituary was wrapped in a strong tone. While the relative of the Star Tribune said that the allegations in the obituary are true, however, they also said that there is more to the story.